I loved Noah Zarc, Mr. Pease’s MG trilogy. And I enjoyed his recent grown up fantasy, Shadow Swarm. But this is his best book yet. Just as Noah was a loose parody of the Bible story, so Joey has similarities to the biblical story of Joseph. If you’re familiar with those old favorites, I’ll let you pick out the parallels–there’s a bunch. 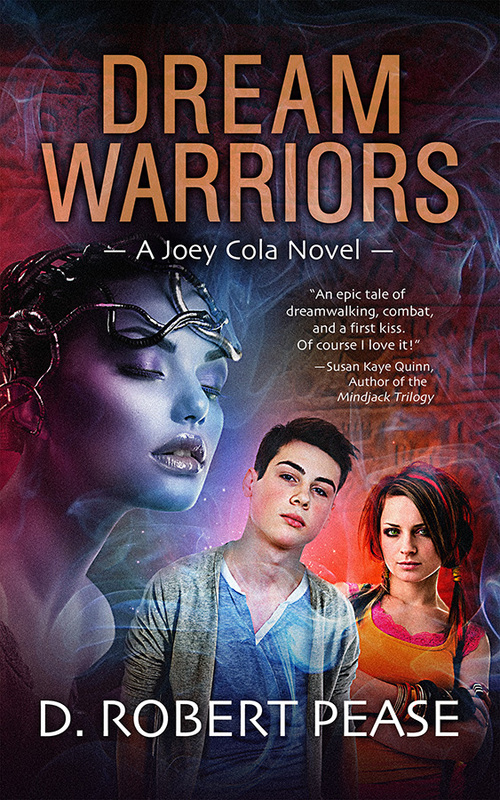 But Joey soon takes a dive into the fantasy world that’s full of originality, fun, danger, romance, and suspense. There are some great twists and turns in here that I never saw coming! Joey’s father is a well-to-do former ambassador to Italy and the patriarch of a large Italian American family. Joey is the eleventh of twelve sons and routinely persecuted for being the favorite. But when his father gives him an amulet, a family heirloom that traces back to ancient Egypt, Joey suddenly finds himself in a position of strength–as a warrior in the world of dreams. The alternate world, however, is more closely linked to reality than he first assumed. And friends and enemies can’t be taken at face value. This one is appropriately billed as YA. There is some violence, but it’s mostly, well, dreamlike. Dream warriors have some great gladiator scenes, but they can’t die. Mortal blows simply send them back to wakefulness. But they can be killed if they’re followed back to their physical bodies. Also, romance is sweet. There’s some very mild sensuality. Nothing I’d censor for my kids (and I’m pretty conservative), but it might be enough to gross out fourth or fifth graders. Language is 100% clean. I highly, highly recommend this one for anyone eighth grade or older. Sounds like a great adventure. Like the idea of mortal blows return them back to wakefulness.